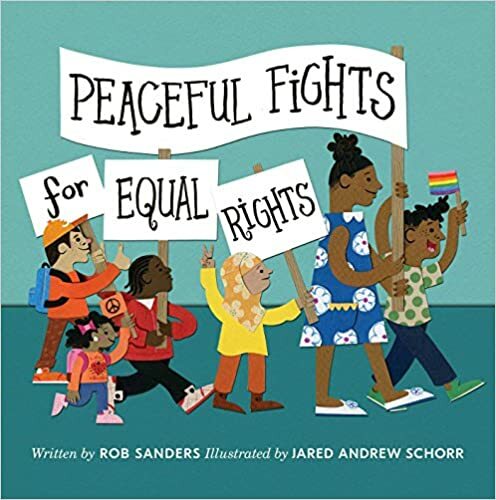 Sanders uses alliteration to introduce activist-minded words and ideas to children, making the book a fun read-aloud that will help build vocabulary. Schorr’s illustrations transmit important content about specific civil rights leaders and issues, often drawing on current events. His illustrations really extend and expand the text’s message while providing opportunity for discussion and reflection. I appreciate the book’s broad and inclusive understanding of activism as anything from music making to supply collecting. Additionally, I appreciate seeing children as agents of social change doing justice oriented work. Even more, the impressively diverse cast of activists demonstrates a thoughtful and sustained commitment to intersectional activism and allyship. A great read, highly recommended for personal and school libraries. I’d love to see this in a board book for very young readers. The bright illustrations and deceptively simple language make this a book that can be enjoyed by many in many ways.